Glen Coe is probably Scotland’s most famous and most scenic Highland glen – and deservedly so. Visitors from all over the world flock here year after year, inspired by the sheer scale and grandeur of its surrounding mountains and fascinated by the intrigue of its turbulent past. 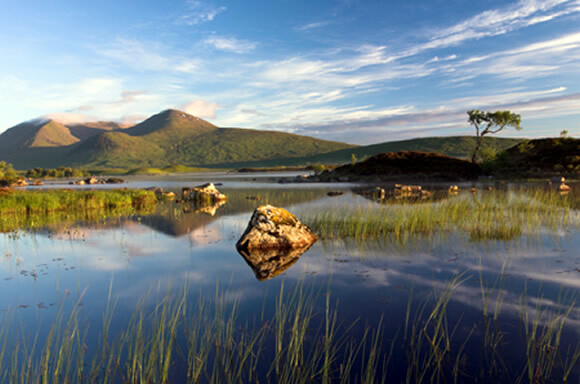 The first view of Glencoe for most people will be of the dominating and impressive peak of Buachaille Etive Mor – The Great Herdsman of Etive from across the bleak expanse of Rannoch Moor. The A82 is the main route from the south, and it rises to over 1000 feet over the great wilderness of Rannoch before slowly descending through the glen itself. Before reaching the Buachaille, look out for Scotland’s original ski area at White Corries overlooking the moor. The popular long distance path, the West Highland Way, cuts beneath the chairlift from the Black Mount before crossing over toward the Devil’s Staircase as it meanders its way to Fort William. Glen Etive is a remote and spectacular glen that cuts off to the south west beneath the great pyramid of the Buachaille. The narrow single track road meanders down Glen Etive to the head of Loch Etive some 13 miles distant, before finally coming to an end. The glen of Glen Coe runs in an east / west direction, with steep sided mountains on both sides. To the north is the Aonach Eagach ridge, a precipitous and craggy knife-edge which is a challenging day out even for experienced mountaineers. From the crest of the ridge, the views north to the Mamores and Ben Nevis are stunning, and not surprisingly, the ridge is a ‘must do’ for most mountaineers. To the south a series of peaks dominate the skyline. After the ‘big’ Buachaille, there’s the ‘wee one’, Buachaille Etive Beag. 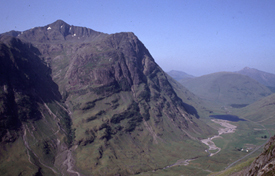 The ridges of Beinn Fhada, Gearr Aonach and Aonach Dubh are collectively known as the Three Sisters of Glen Coe. The best view is from the old road, above where the gorge narrows, but the most popular viewpoint is likely to be from the Piper’s lay-by slightly lower down, so-called because of the usual sideshow in the summer months. Behind the collective mass of ridges that form the Three Sisters is the (hidden from this view) summit of Bidean nam Bian, the highest peak in Argyll. The Piper’s lay-by is the usual starting point for the walks to Coire Gabhail, more commonly known as the Lost Valley. A boulder choke ensures that the flat floor of this small side valley is hidden from view. As the glen heads down towards the sea loch of Loch Leven, it turns to the north- west and its here that you’ll find the old drovers stop of Clachaig Inn, adjacent to Clachaig Chalets and located close to the river Coe on the old village road. You’re more likely to see thirsty climbers than stagecoaches these days! It’s only a short distance to the small village of Glencoe, overlooked by the impressively shaped (and aptly named) Pap of Glencoe. The modestly sized village provides the visitor with a wide range of facilities, from bed and breakfast accommodation, restaurant and cafes, petrol station, post office and shop. There’s also a very good but quite small museum and some excellent gentle walks around the Glencoe Lochan, formerly the Strathcona House & estate. 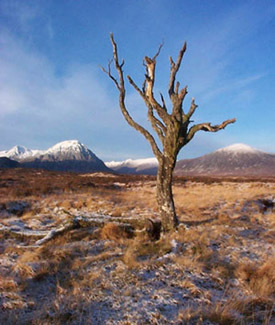 Much of the glen is owned by the National Trust for Scotland. To learn more about the mountains and the natural history of Glencoe, and the events which led to the infamous massacre of 1692, a visit to the nearby Visitor Centre is highly recommended. Glencoe has much to offer the visitor, both in summer and in winter, and is indeed a glen for all seasons. It is regarded by many as a gateway to the Highlands, and is a well established centre within the Outdoor Capital of the UK.